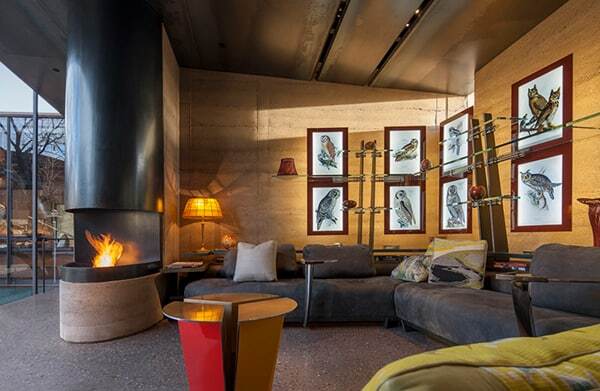 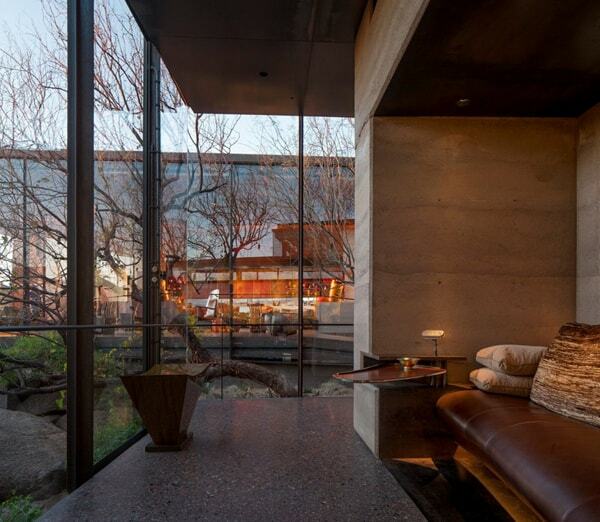 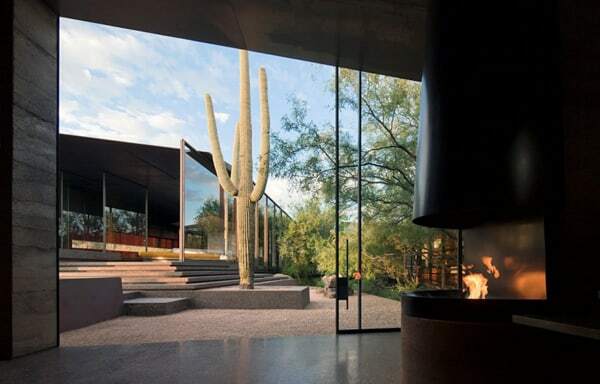 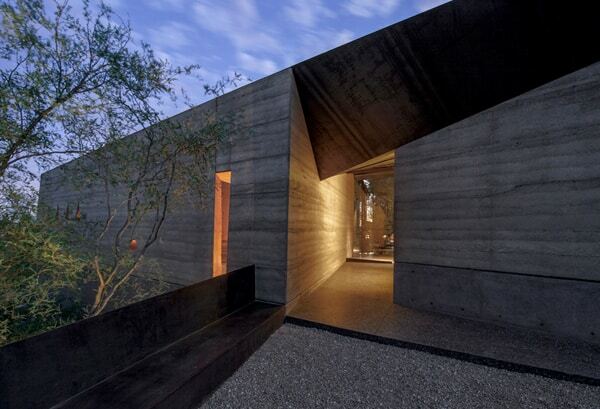 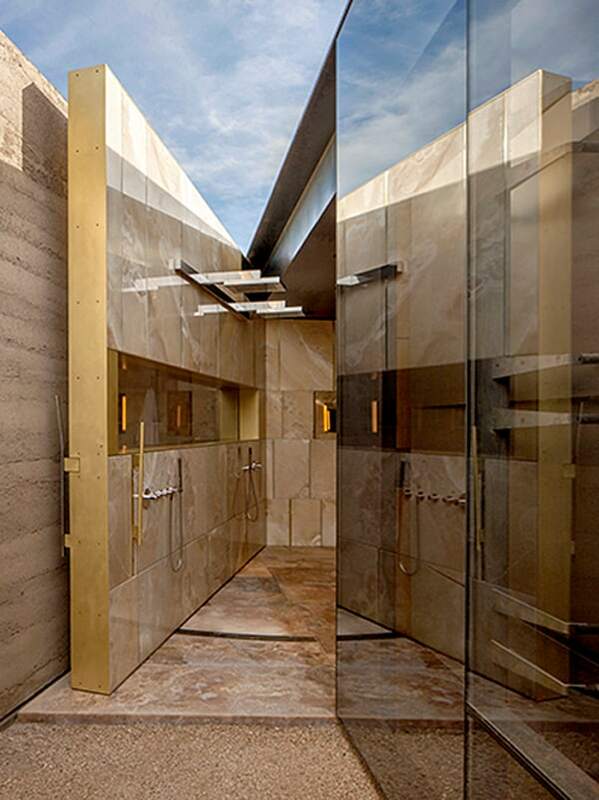 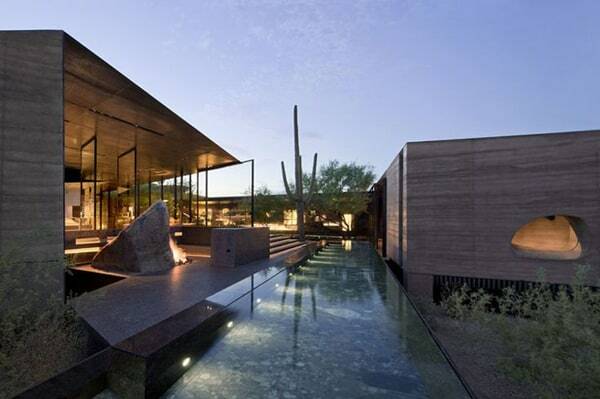 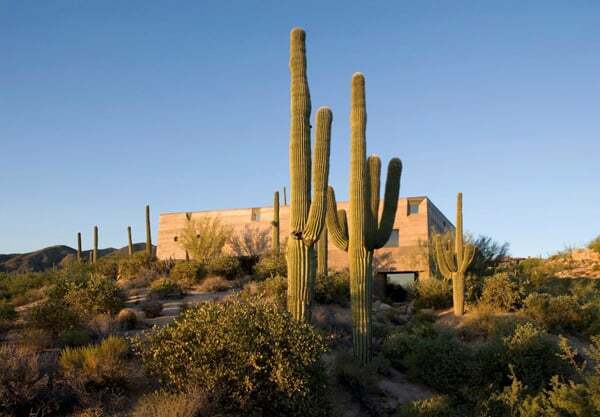 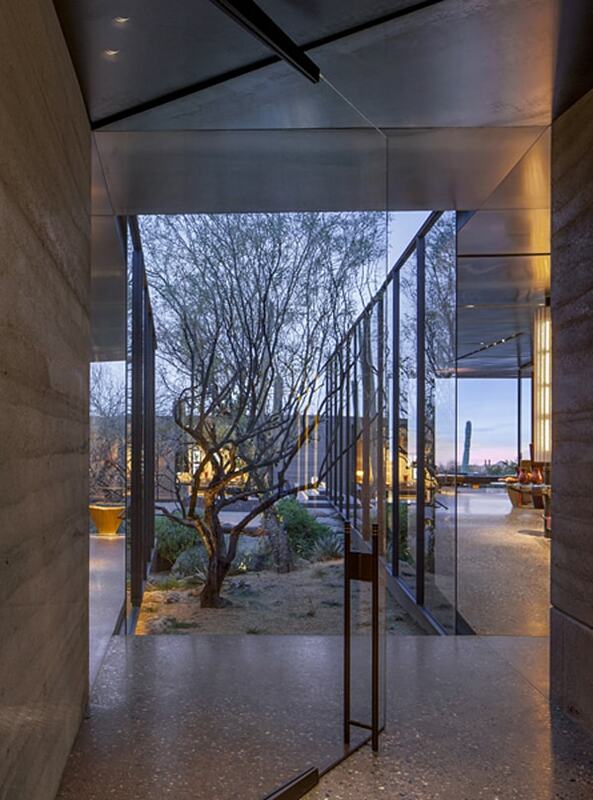 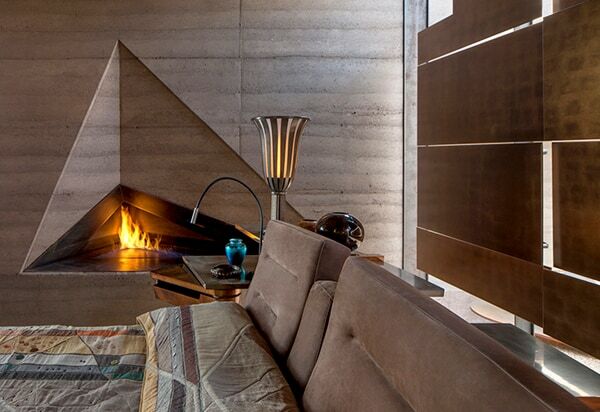 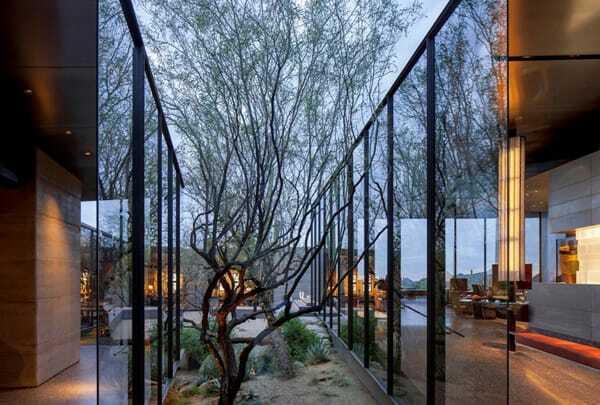 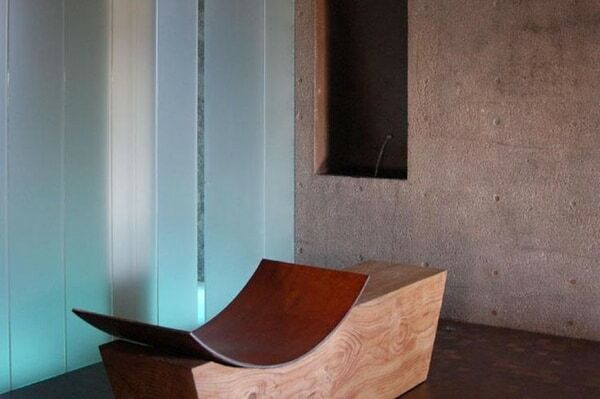 Desert Courtyard House is a mass of concrete and rammed earth walls that meet the sky without termination, designed by Wendell Burnette Architects in Scottsdale, Arizona. 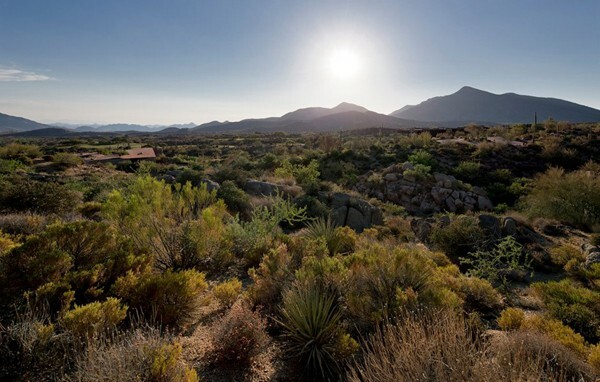 The site is a peninsula of granite outcroppings, where ocotillos march across a private drive that descends a ridge following a natural wash. 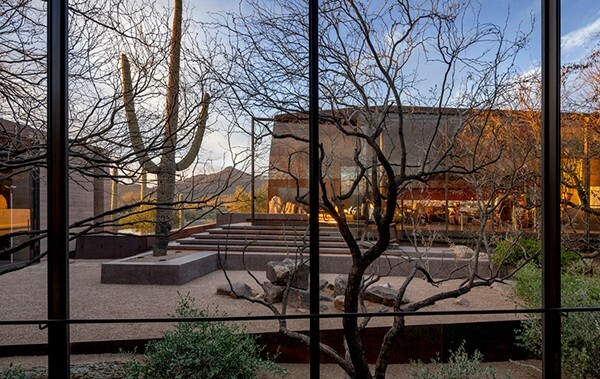 This project’s form emerges amidst towering Saguaros and geological outcroppings as the depth and complexity of the desert floor is revealed. 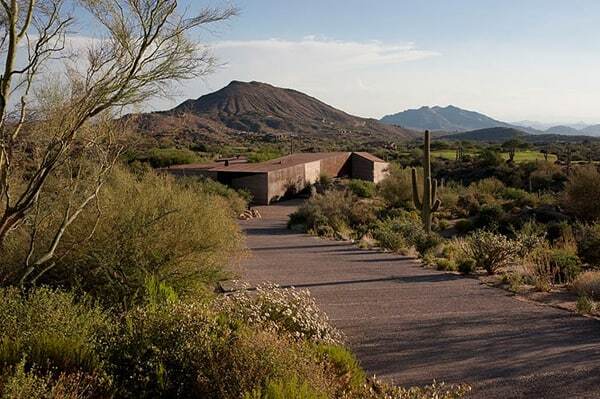 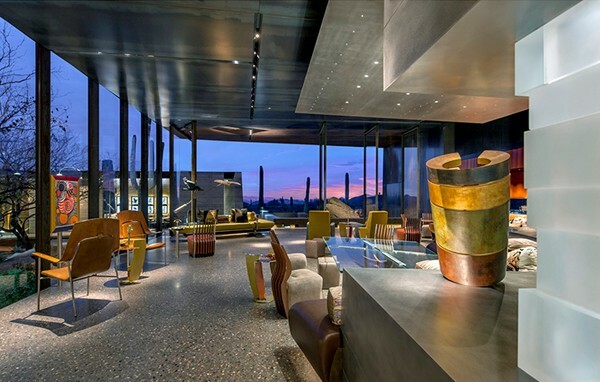 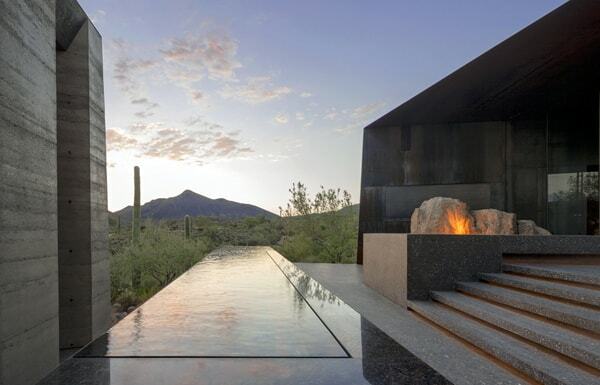 The building site, further down a long private drive, levels out toward the west into an edge condition dominated by an expansive vista – layers and layers of distant mountain ranges – that in the evening seem to epitomize the drama of the Arizona Sunset. 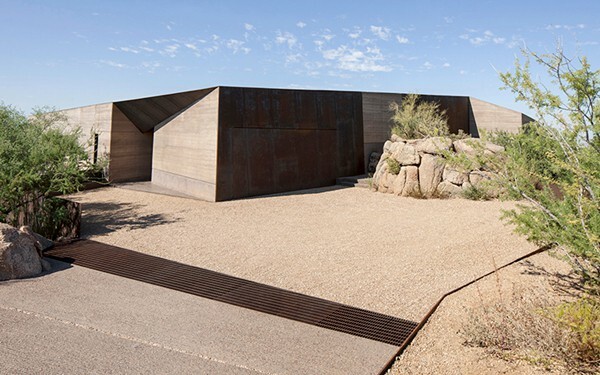 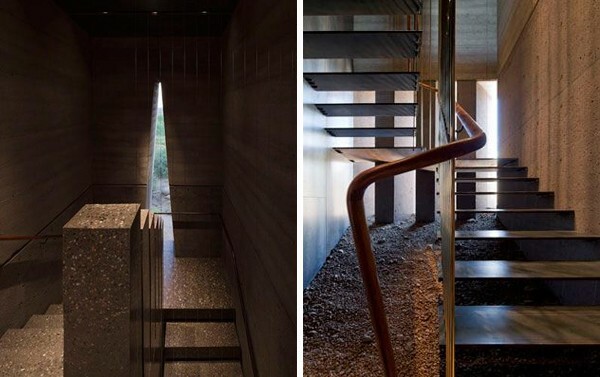 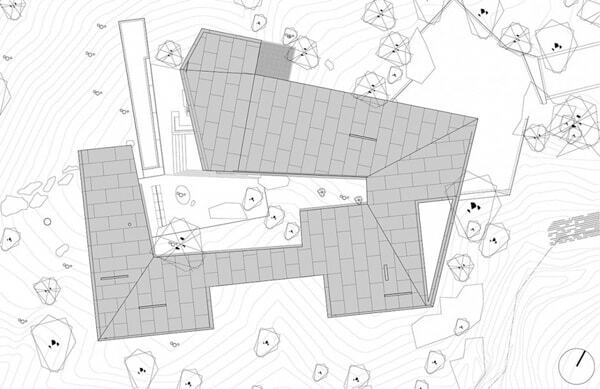 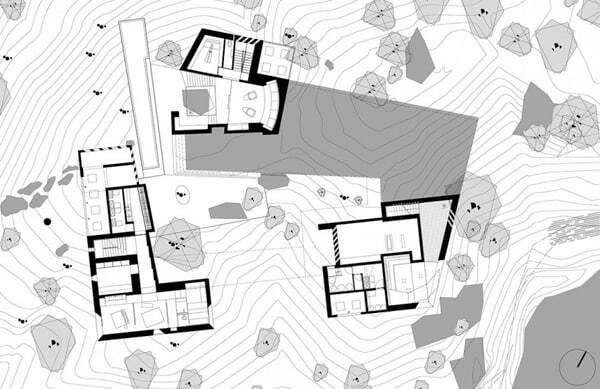 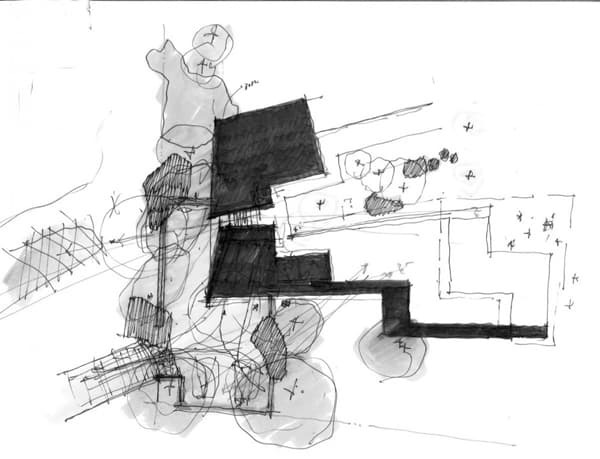 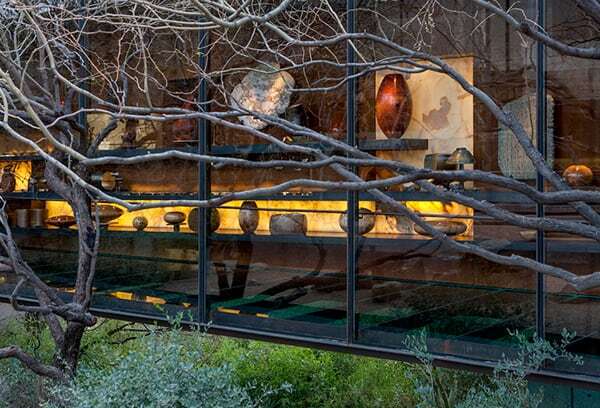 Due to the elevation of the site beneath the community’s gaze and the entry gate at the road it became important to us – to recede the house as a deep shadow – into the depth and complexity of the desert floor below. 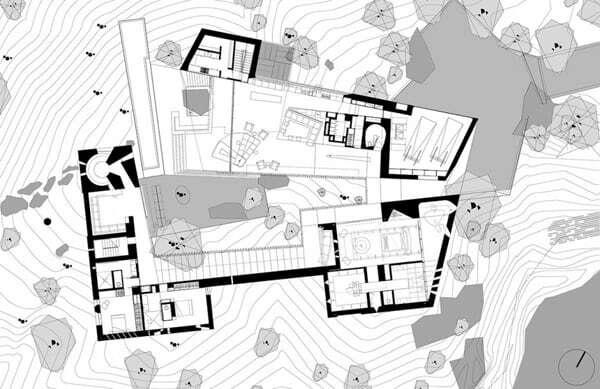 Mass, Hollowed Mass, Faceted Mass, Fissured Mass, Mass that cracks open and hinges apart informed how we proceeded to give this home its defining qualities from the courtyard plan, to the split-massing, all the way down to the fittings and fixtures that one touches with the hand or the eye. 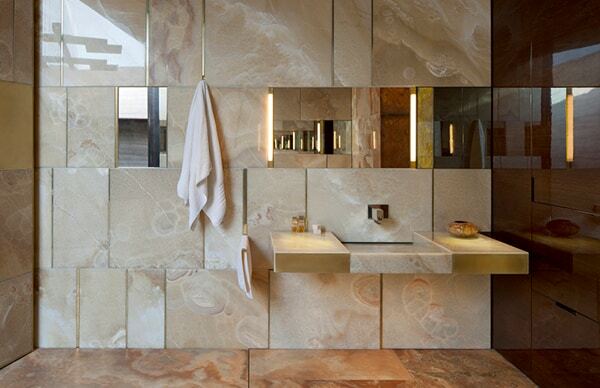 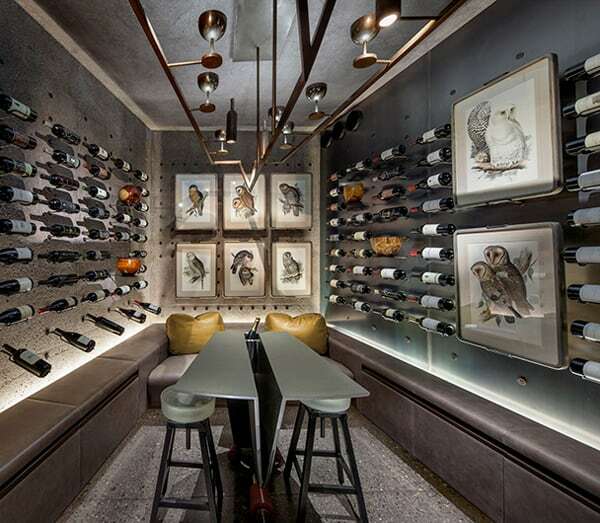 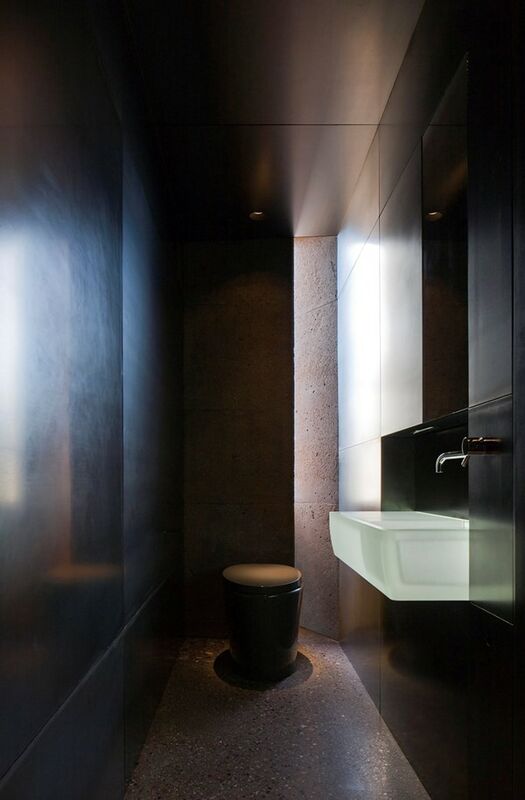 For instance, the millwork is volumetric only revealing contents within when a contoured bronze void is touched with the fingertips allowing the mass to be gently cracked open. 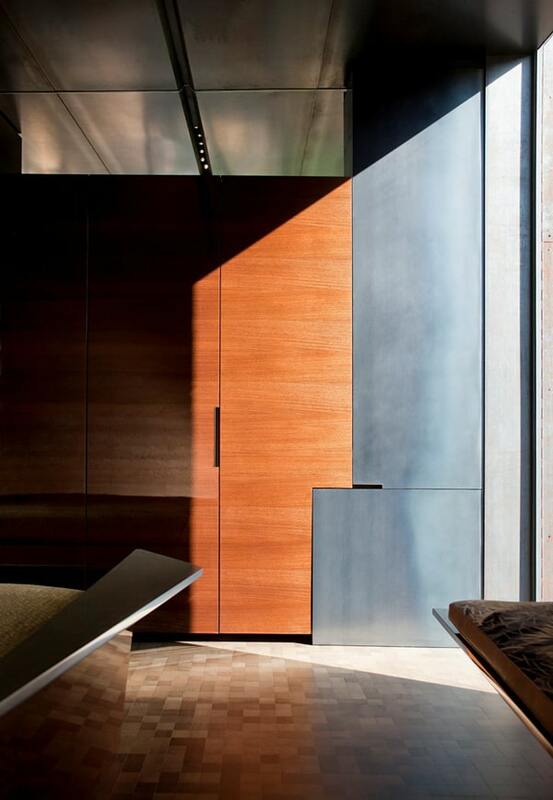 Long fissures in the mill-finish steel plate ceiling reveal light while maintaining the quality of nothingness at night. 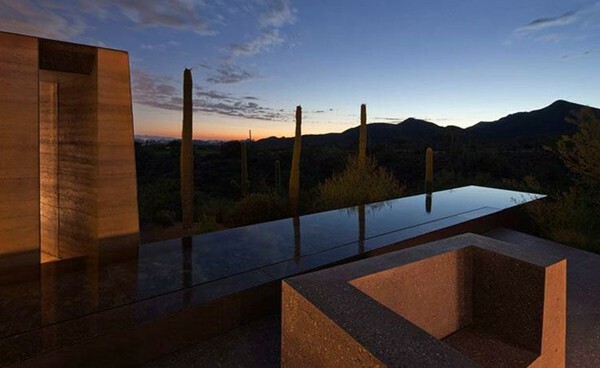 Mass and the improbability of delicacy discovered within it, is what gives the Sonoran Desert its remarkable presence. 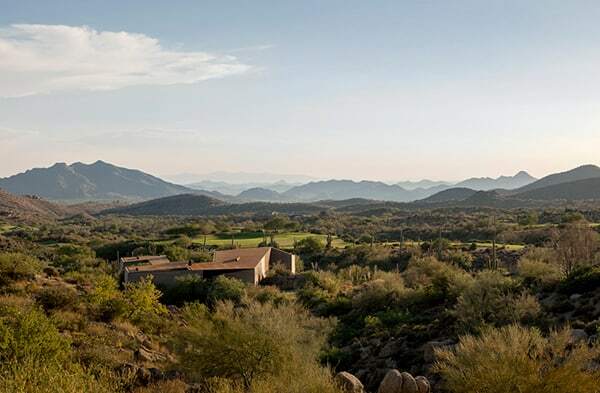 As our clients and their guests move into the mass of this landform into our Engawa, we hope they will always rediscover with a hint of surprise the preciousness of things. 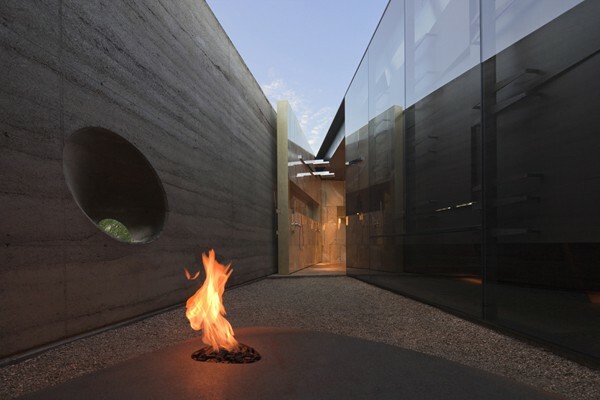 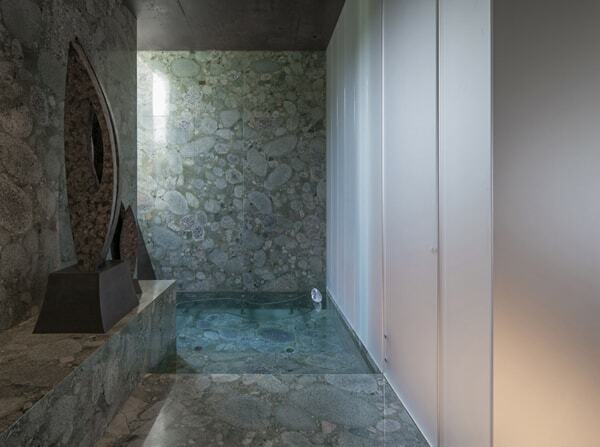 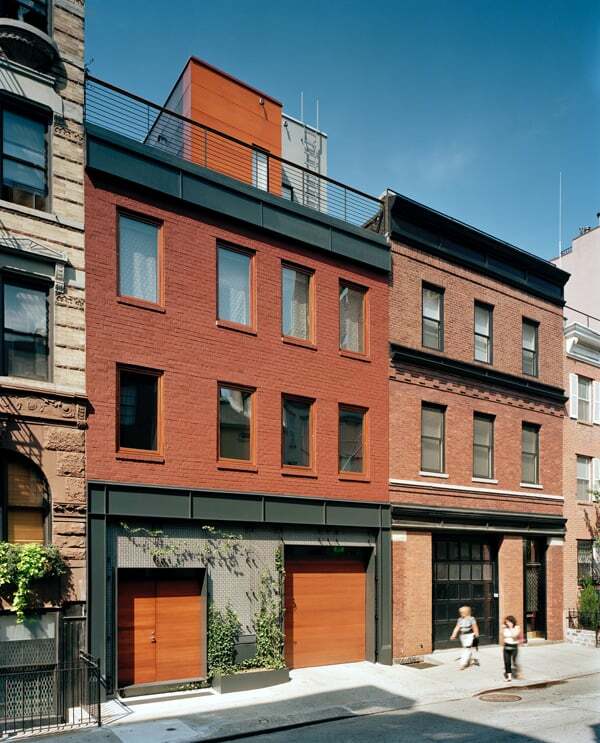 The battered walls envelop and protect conditioned spaces that surround a central courtyard. 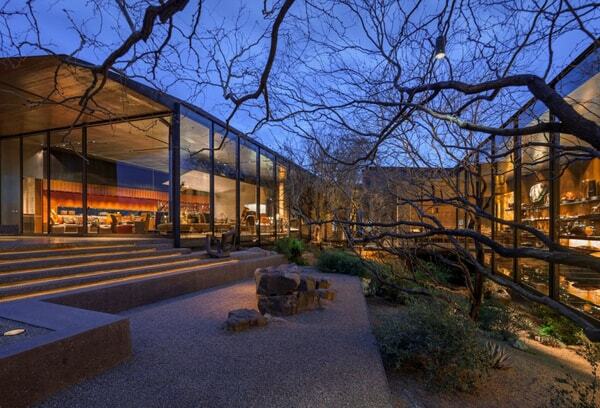 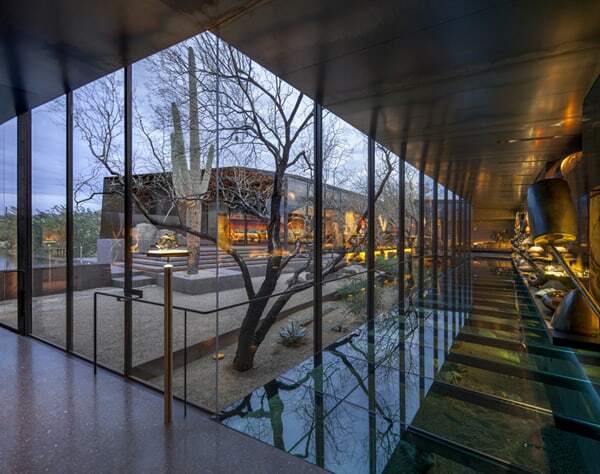 During the daytime, the courtyard is defined by a continuous ribbon of glass, the desert floor and sky. 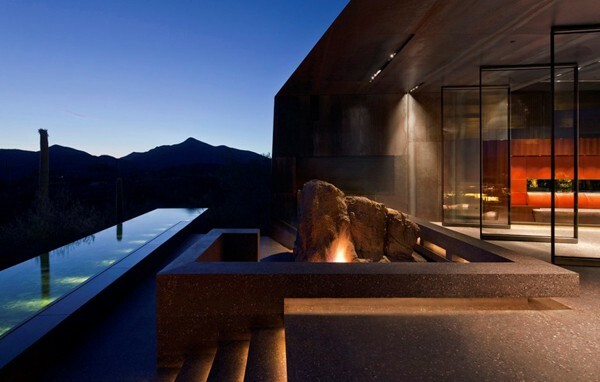 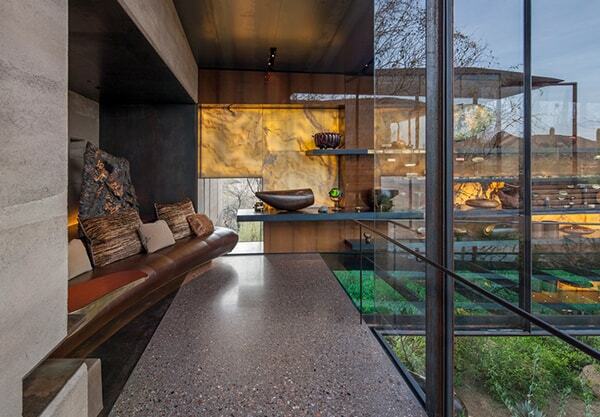 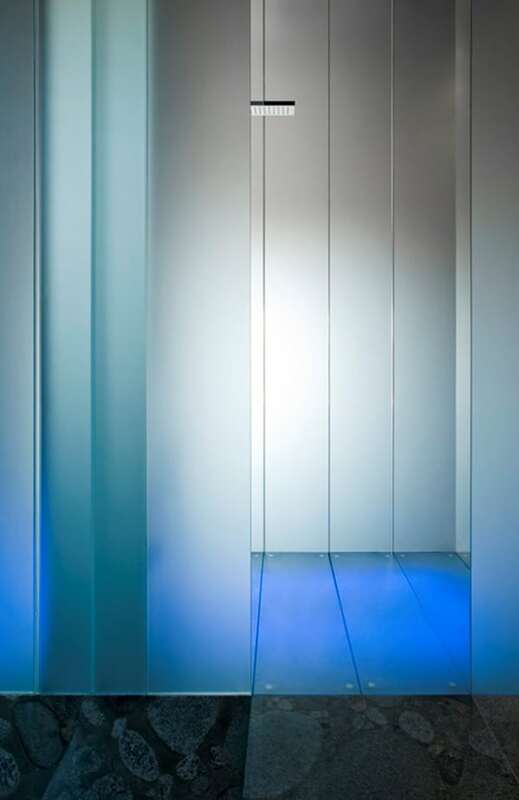 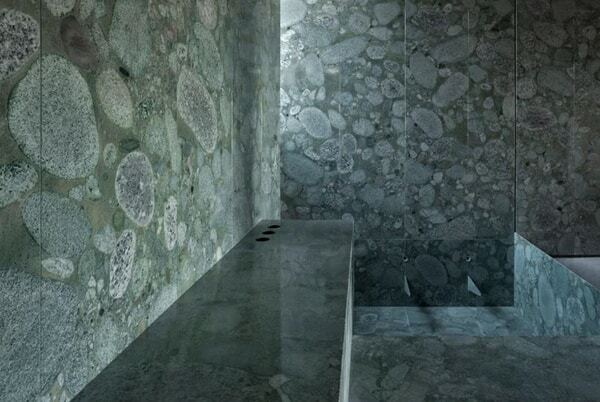 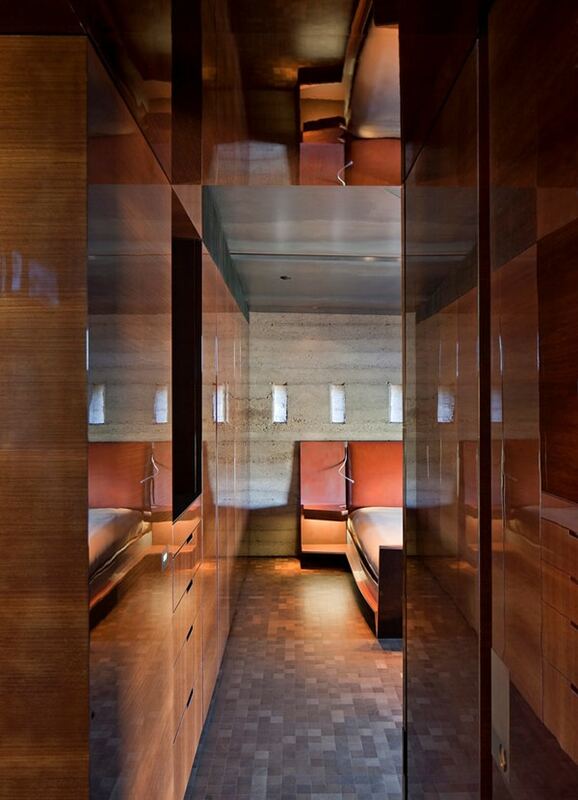 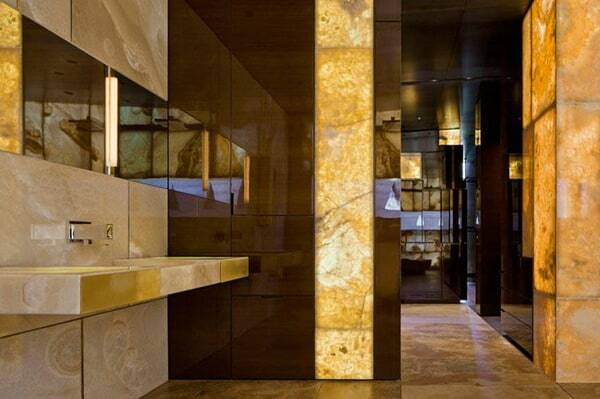 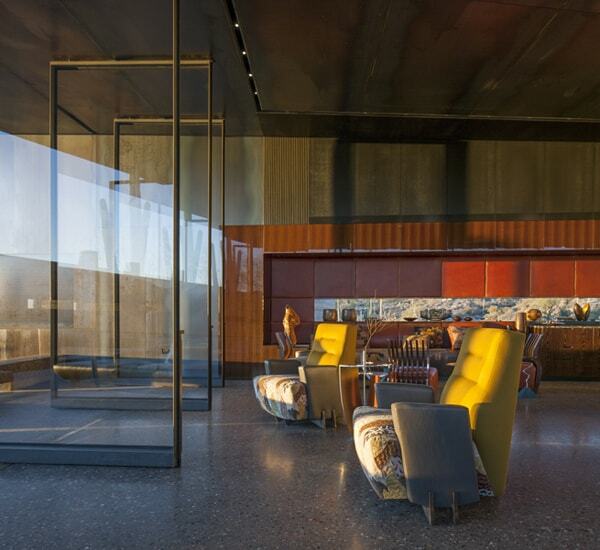 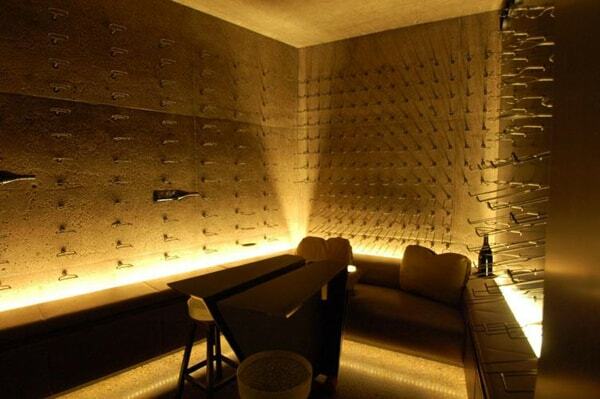 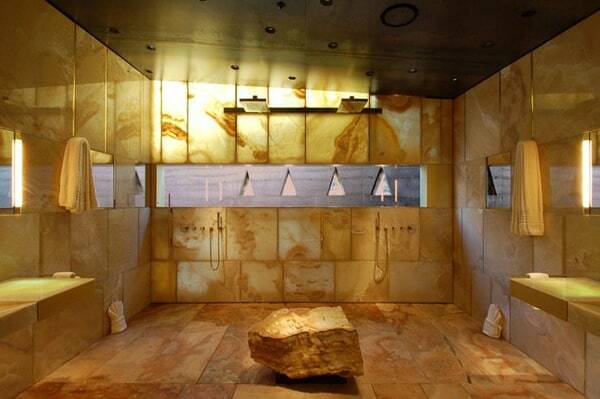 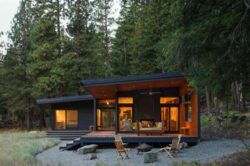 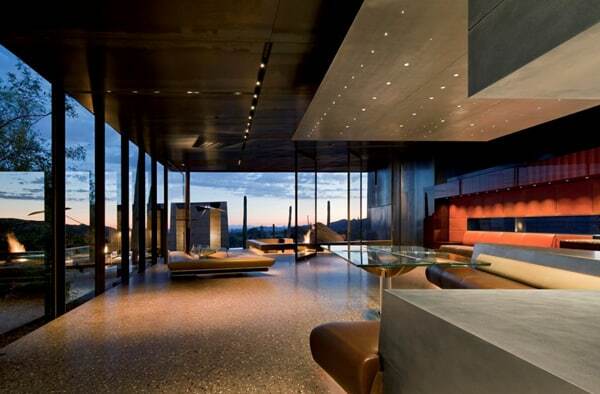 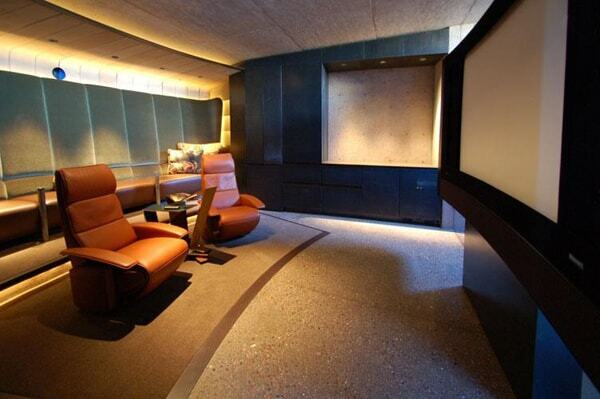 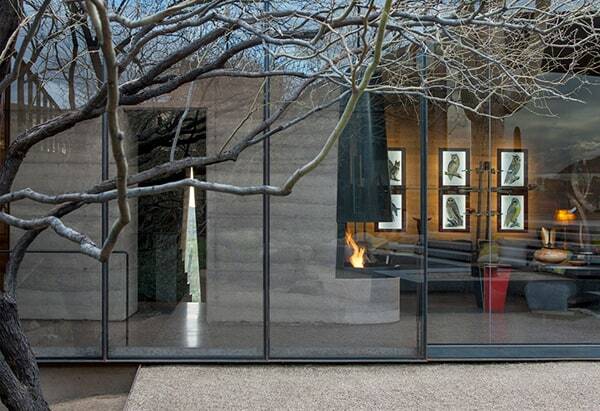 At night, the glass dissolves and the steel plate ceiling of the interior spaces merges with the dark sky. 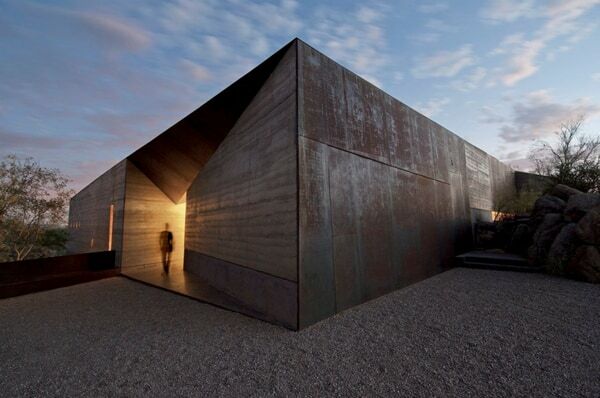 The roof is clad in weathered steel and, when seen from above, recedes into the landscape as a deep shadow. 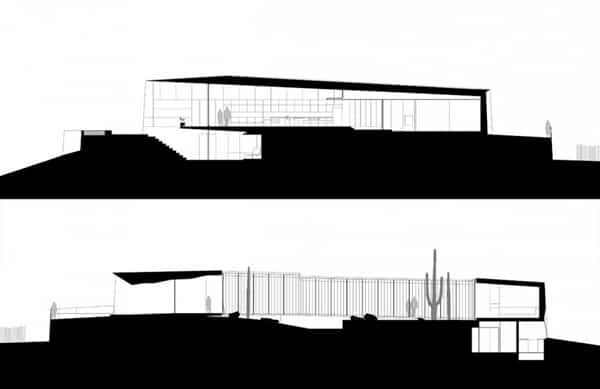 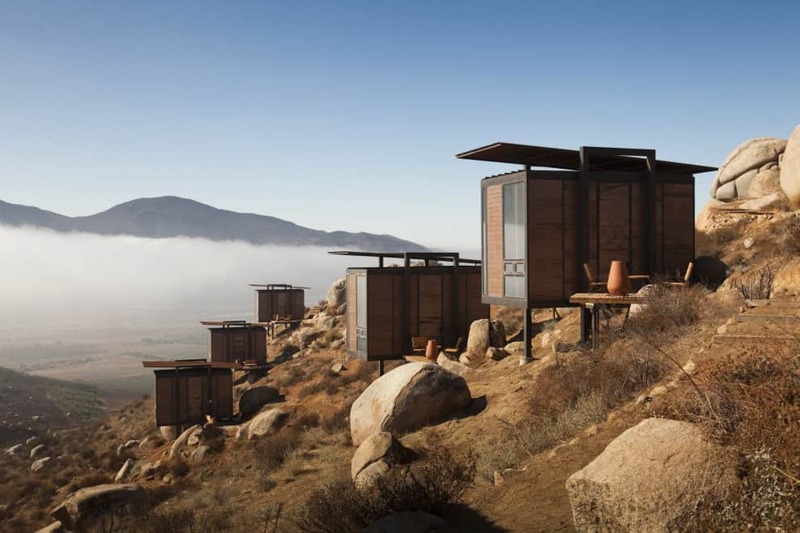 Experience of place is prioritized by means of the project’s configuration and materiality allowing for a primordial understanding of the desert landscape.